Come see this phenomenal property priced to sell quick! 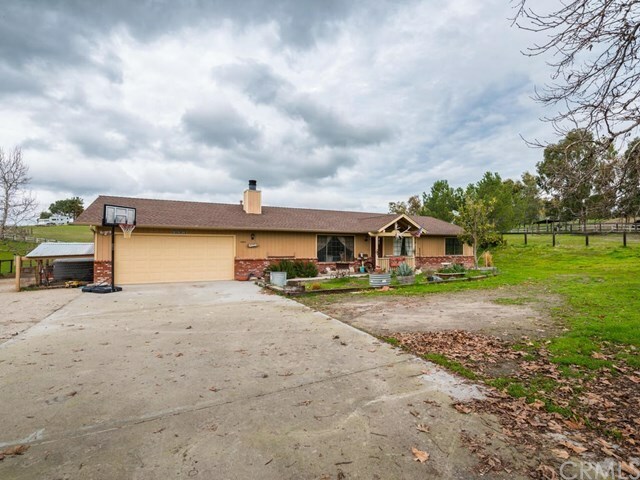 Located 12 miles outside of town this house gives you the solitude, seclusion and feel of the small family ranch life, with only being minutes from everything you need. The lot features thousands of dollars in fencing and is wonderfully enclosed safe for animals of any kind. With a 2 stall barn and tack room, 2 separate RV hookups one with septic, a warm inviting patio area ideal for entertaining family or friends and an awesome garden, this home can fit any family with any lifestyle. The well is strong and high producing, and the septic has had ZERO issues. The roof is just over 5 years old. The garage features an enclosed laundry room, and plentiful room for your toys. The surrounding hills are cloaked in luscious vineyards. Car noise from the highway are non-existent from inside the home. Come see this amazing property with endless possibilities. One of the most unique items about this house is a book that has been passed down since the original to every other, owner after owner with everything imaginable about the property, from locations of trees and their type, to neighbors contacts, to a map of an old river that used to run through the property. You could spend hours going through all of the historic information about your new home. The property is eligible for USDA, ZERO DOWN loan per USDA website. Come see this slice of affordable heaven on the central coast. Directions: Take US 101 to Atascadero, Get off on exit CA-41, continue down approximately 12 miles, house is on the left.